Posted by aquaman on January 08, 2007. In the spirit of Teen Wolf Too and Grover Cleveland's second term, here's the unnecessary sequel to last week's report on the NFL First Ladies, Who Are They Now? The NFL Quarterbacks' Wives Club (and girlfriends, too). Tiffany Rivers, wife of San Diego Chargers QB Philip. Philip & Tiffany pose with the first-born grandchild of Giants GM Ernie Acorsi, the final piece of the 2004 Eli Manning deal. 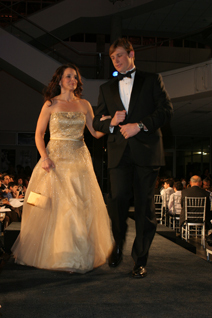 Alison Mista, wife of Chicago Bears QB Rex Grossman. 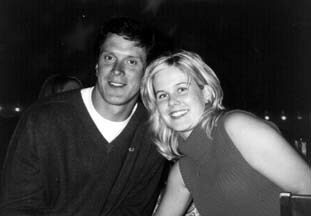 When Rex was drafted by the Bears, Alison transferred from the University of Florida to Northwestern. She brought receiver gloves on their honeymoon, where they played a lot of catch. Last week against the Packers, Alison matched Rex's quarterback rating. 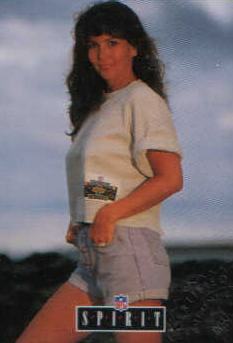 Mary Garrard, wife of Jacksonville Jaguars QB David. When I was a senior at Duke, I remember Garrard and East Carolina coming in and absolutely crushing us. 38-0, I believe. 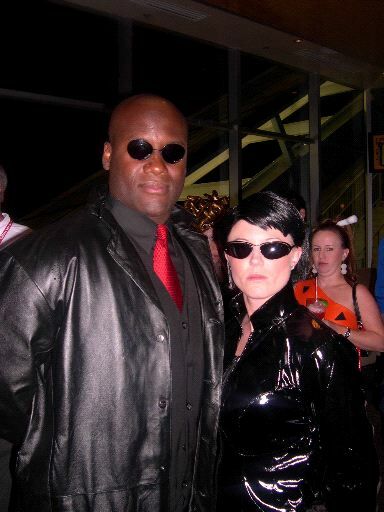 Then, too, he was dressed as Morpheus. 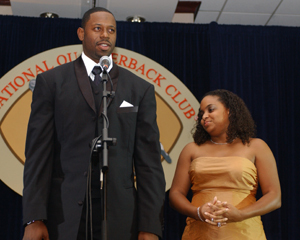 Is there anyone who had a worst last two years than Aaron Brooks? Last year he was practicing on pavement riddled with broken glass in New Orleans. Then he goes to Oakland to run the worst offensive football team I've ever seen, coached by Tom Walsh, who'd been running a bed and breakfast in Idaho the last few years (Walsh was also the town's mayor). Tough times for the Brooks family. 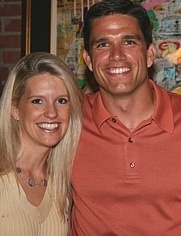 Julie Green, wife of Kansas City Chiefs QB Trent. Chiefs fans begged me to find a picture of Julie Huard, wife of Trent's backup Damon. Sorry guys. I tried as hard as I could (meaning I conducted an unsuccessful Google Image Search of "Julie Huard"). 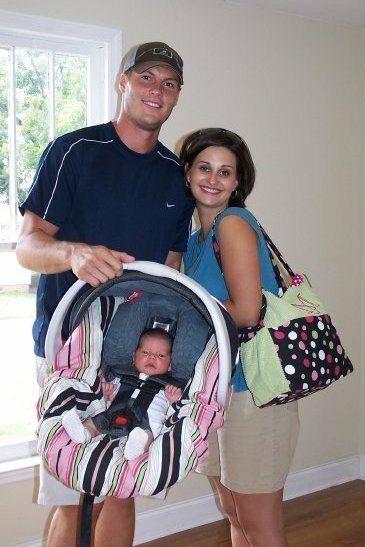 Robin Pennington, wife of New York Jets QB Chad. They keep it close to the vest. I've got nothing. Maria Rosenfels, wife of Houston Texans backup QB Sage. I'm rooting for the Giants to sign Sage to back up Eli next season. This proves the Manning Era isn't going as expected. Maura Bledsoe, wife of Dallas Cowboys backup QB Drew. One more round of applause for Drew's fake blog, TonyHomo.com, ghostwritten by the guys at Straight Cash Homey. I'd also accept Drew as Eli's backup, provided he'll blog about the experience. Mitzi Testaverde, wife of never-say-retire New England Patriots backup QB Vinny. She was a Tampa Bay Buccaneer cheerleader forever immortalized in the 1992 Pro Line NFL Portraits trading card set. And that wraps it up. You can read Part I here. We do more here at YesButNoButYes than just dig up photos of women married to quarterbacks. Read about Ten Albums You've Never Heard. Check out our growing archive of investigative pieces in the Where Are They Now? series. Or follow my commuting adventures in the Commuting Suicide section. You can piss away a lot of time with the crap we've already written. Have a look around. *This photo was emailed to me with a short message reading, "trust me its mcnabbs wife." I usually don't trust people who tell me to trust them and refuse to use apostrophes. But I'm taking a chance. You guys should do NFL STARS WIVES.... I WOULD LIKE TO SEE WHAT OTHER GUYS WIVES LOOK LIKE. Where is Joey Harrington's future wife? Any pics? Tried to post a picture of new Texans QB Matt Schaub's fiance Laurie (ex Falcons Cheerleader). Seems like he took a little bit of Atlanta with him!